It’s been more than a year since President Barack Obama visited Alaska and became the first sitting president to travel above the Arctic Circle. The trip was designed to draw attention to climate change in the lead up to last year’s international conference in Paris. And the president went out of his way to highlight Alaska villages threatened by rapid erosion. But as President Obama prepares to leave office, most of those villages find themselves no closer to a solution. On September 2, 2015, Obama stepped up to a microphone in the Kotzebue school gym and greeted the loudly cheering crowd. 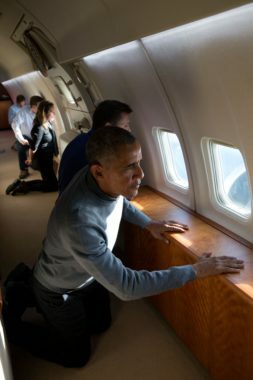 Obama said he had come north for one big reason: to raise the alarm about the dangers of climate change in one of the places where it’s most obvious — places like the eroding village of Kivalina, which he flew over on his way to Kotzebue. 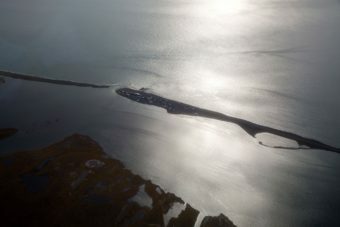 For many Alaskans, he said, it’s no longer a question of if they will have to relocate, but when. Climate change, he said, should be no different. Maija Lukin was mayor of Kotzebue during the president’s visit. She also worked on climate change issues for the Maniilaq Association, the regional native nonprofit corporation. Lukin, personally, was pretty excited about Obama’s visit. And, professionally, she hoped his visit would draw attention to the issues facing rural Alaska. Which it did. And she appreciates that. But, she said attention isn’t enough. And on that front, the response hasn’t matched the rhetoric. Five months after the president’s visit, the Obama administration released its major funding proposal, as part of its final budget request to Congress: $400 million over ten years for issues including village relocation in rural Alaska. The money would have been part of a proposed $2 billion Coastal Climate Resilience program overseen by the Interior Department. But Alaska Senator Lisa Murkowski called that, basically, a bait and switch. The program would have been paid for by taking revenue away from other oil-producing states, and it had little chance of passing Congress. Murkowski accused the Obama administration of using Alaska as simply a “backdrop” for his climate change agenda. During his visit to Kotzebue, Obama also announced that the Denali Commission, which has historically built infrastructure in rural Alaska, would be the lead federal agency coordinating relocation efforts. Joel Neimeyer, co-chair of the Denali Commission, said that’s a pretty big deal. “There would be one federal agency that could marshal all the federal agencies together and then be responsive to the state and the individual communities,” Neimeyer said. But the new assignment came with no new funding. The Obama administration requested an additional $4 million per year for the commission. But Congress has yet to appropriate it. Neimeyer said the Denali Commission is doing what it can within its small existing budget. But it’s frustrating. For a while this year, Neimeyer said, he even had trouble getting a call back from the White House to clarify his agency’s new assignment. Obama, of course, has many fans in rural Alaska. They point out there’s only so much the president can do. It’s Congress that controls the federal purse strings. And Sally Russell Cox, a planner with the state who’s worked on relocation for about a decade, said the issues are clearly getting more attention. Agencies including the Departments of Agriculture, Energy and Interior have made money available for things like water infrastructure, energy efficiency and planning — but nothing close to the amounts needed to move a whole village. The Army Corps of Engineers has estimated it will cost $80 to $130 million just to move about 350 people in Newtok, one of the most threatened villages. Cox said the state will continue to do what it can. But, she said the federal government has a special responsibility, because in many cases, villages are where they are because the federal government put them there — often by choosing the location for a school. With Obama on his way out the door, that federal responsibility now falls to Congress and the incoming Trump administration. Lukin said she hopes the next president will pay attention, because rural Alaska is running out of time.